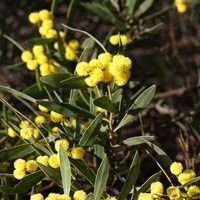 Acacia Trees, Plant Profile, Species Photographs & Nurseries. A diverse genus, Acacia trees are found widely in both Australia and South Africa. They are fast growing and most species have attractive flowers, usually in spring, with some flowering in winter. They vary in growth habit, with some being low growing plants, such as the A. cognata cultivars, while others are large trees. Commonly called ‘Wattle Trees’ are widespread with over 1500 species, nearly 1000 of which are found in Australia. 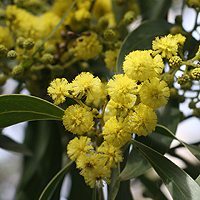 The’ Golden Wattle’ or Acacia pycnatha (pictured below) is the National Floral Emblem of Australia, and being a smaller growing species can be at home in the garden. Acacia tree species such as A. cognata, A. implexa and others are becoming more popular with landscapers due to the drought tolerant nature of acacias and the improved species now available. Commonly called ‘Wattle Trees’ are widespread with over 1500 species, nearly 1000 of which are found in Australia. The’ Golden Wattle’ or Acacia pycnatha (pictured) is the National Floral Emblem of Australia, and being a smaller growing species can be at home in the garden. An interesting habit is the change of leaf structure as the tree matures, from a soft ferny look to a true leaf. Some species are leafless, such as Acacia acphylla commonly called the Leafless Rock Wattle. Flowers are mainly seen to be yellow, however white and creamy flowering varieties such as A. falcata and A. genistifolia are also found. One red flowering variety has been identified and this is A. leprosa ‘Scarlet Blaze’. For the home gardener a few stand out varieties should be considerd. Low Growing and Ground Cover Types. Low growing species include forms of Acacia cognata, these are plants can look great in a pot and are extremely popular with landscapers, A. cognata is a great plant in rockeries, but works its magic as a low border plant or a replacement for buxus. Look for A. cognata ‘River Cascade’, A. cognata ‘Limelight’ and A. cognata Dwarf ‘Mini Cog’. A. baileyana prostrate is a form of the popular Cootamundra wattle, very low growing with masses of yellow flowers. A. glaucoptera, A. hilliana (which grows in tropical climates), A. myrtifolia and A.redolens are other low growing varieties. A. baileyana or ‘Cootamundra Wattle’, masses of golden yellow flowers cover the tree in winter to spring. A.beckleri from the Flinders ranges, this acacia forms a rounded bush to 2m, well suited to smalller gardens. A. boormanii or ‘Snowy River Wattle’, a smaller growing shrub to around 3m in height, spring flowering and again masses of flowers. A. chinchillensis is the Chinchilla Wattle – Highly ornamental shrub to around 2m in height. A. complanata, long flowering from spring through to autumn with deeper yellow flowers that most. A. dealbata or ‘Silver Wattle’ is a tall tree reaching from 10 – 25min height depending on conditions. Cream flowers in spring. A. drummondi is a small growing species, 2 – 3m, with deep green foliage, golden flowers in spring. A. longifolia or ‘Sydney golden wattle’ is another popular species reaching around 6m in height. A. melanoxylon is known as the ‘Blackwood’ it is used as a timber tree as well as in larger parks and gardens as a shade tree..
A. podalyrifolia or ‘Mount Morgan Wattle’ is popular in the home garden. Silvery green foliage. 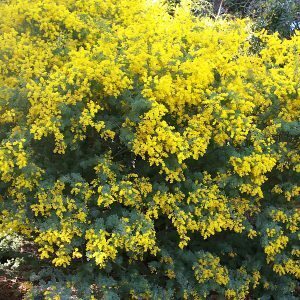 Wattles are easy to grow and generally are regarded as drought tolerant, they handle full sun to light shade and do best when planted as young trees of tubestock. Wattles can be pruned back after flowering to keep a more compact growth habit.